Rotherham Hospice plans to do even more over the next 20 years as leaders from the local business community are set to work as the charity strives for excellence. The only adult hospice in Rotherham for the people of Rotherham, Rotherham Hospice is an independent charity and must raise significant sums of money each year in order to pay for the quality care provided free of charge to patients, their families and carers. The charity needs £5m a year with £2.2m needed to be raised each year through voluntary support. Chief executive at Rotherham Hospice, Christopher Duff has raided his contacts book and pulled together a dynamic eight-strong squad. It includes Pyronix boss Julie Kenny CBE, Trevor Wragg, MD of Horbury Group, recruitment boss Nick Cragg and Vince Middleton OBE, the MD of Newburgh Engineering. They are joined by Nick Alexander, MD of Garnett Dickinson Group, Jamie Sharp, former MD of steel giant Outokumpu in Sheffield, IT boss and Sheffield Eagles chief executive John Whaling, and Darren Baker, MD of JB Doors. 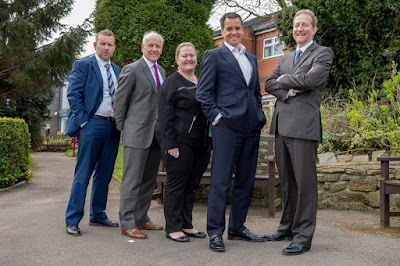 Duff (pictured, far right) said: "Our primary role at the hospice is to care for the people of Rotherham when they or their families are coping with terminal illnesses, but we have to run as a business and we strive for excellence in that arena, just as other companies do. "The hospice celebrates 20 years of excellence in care this year. These people, some of the town's most successful entrepreneurs and professionals, are pooling their experience and knowledge to help me drive it to best in class so we can do even more in the next 20 years. "They are sharp-minded people who solve problems from a local perspective. They bring a vast amount of contacts to the table.They are incredibly busy people and I am grateful and proud that they are giving up their time and energy for the hospice." Nick Cragg, founder of national recruitment company Stafforce and founder and chairman of investment company Nicholas Associates Group (pictured, second left), added: "I got involved because I want to be a part of an extremely valuable organisation determined to excel on a regional and national level. "Like many business people I find it exciting and rewarding to be associated with organisations striving to be recognised as the very best at what they do. I urge other business people to join us. Together we can pool expertise and help drive the hospice to be best in class." The "Dream Team" has already embarked on a project to benchmark Rotherham’s hospice with three others in towns with similar demographics and economic factors. Data is being analysed to identify where improvements can be made and find a way of ensuring a greater percentage of residents can access hospice care. Duff concludes: "Each year around 2,500 residents of the Rotherham borough die. Most would prefer to die in their home or in the hospice and we are proud to say we support over 700 in their last wish. This is a remarkably high number any hospice would be proud of and we are determined to do more. We will achieve this by building on the strong foundations we have created in the last 20 years and by forging strong links with the town's business community. "We hope other companies will join us on the journey as we harness ideas, energy, services and money."